Bailey grew up with cancer. Born just a month prior to her diagnosis, she held the designation of being the youngest patient Diamond Children’s Medical Center in Tucson ever had. Her case was so rare, doctors didn’t have a treatment plan in place for a one-month-old with leukemia. They were just winging it. When they told us in December of 2014 that she had maybe four to five months to live, my husband cried, but I was just numb. I hovered around her. We spent from 1 a.m. to 7 a.m. that morning trying to figure out a treatment plan. I was just thinking, I’ve got to stay strong to make her better. She lived for almost 26 more months—just past her 2nd birthday. We were hoping for a bone marrow transplant when she turned two, and radiation after that, but she just kept relapsing. Every time she relapsed it was more intense. Chemo couldn’t keep up. I remember the date—Jan. 4, 2017—when they told us there was nothing more they could do. She passed on Feb. 13. It’s unfair that cancer was all she knew, and yes, it makes me mad. At least half of her life was spent in the hospital. But you also have to know—she was a really happy girl. She love bubbles and Doc McStuffins. 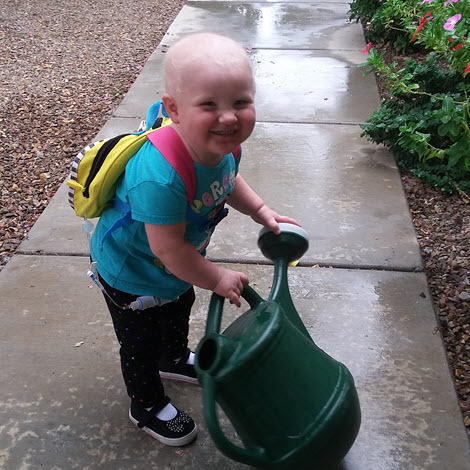 She loved to water the flowers in our front yard. She would go out there with a backpack full of chemo and water the flowers, which we ended up calling Bailey’s Flowers. She loved her dogs. Hoss, our 180-pound Great Dane, was her favorite. He was amazing with her. He knew he had to protect her. She always had a smile, and everyone in the hospital knew who she was. It was just her strength coming through. Her being named this year’s Memorial Hero means that people can see who she was. Joining the Leukemia and Lymphoma Society has been healing. Our family is still struggling, but I know Bailey would want us to be strong, like her. She would want us to continue watering her flowers and her trees. I want people to know leukemia can strike at any age. But the research that LLS is doing gives me hope. Hope that no one else has to go through this.